Quinoa Salad with Mango, Black Beans, and Cilantro Lime Dressing, full of flavor with a little sweet from the mango, this is a delicious and refreshing summer salad! I really do try to eat healthy most of the time. I’m human though and I slip. Lately I’ve been walking to the “Candy Corner” at work once a day and grabbing a miniature candy bar, usually about the time I have to take mail around or right before I head out on my lunch break. I have a super sweet tooth and my son’s come by it quite naturally (especially Justin!). For the most part, I don’t eat too many sweets in one day. I’ve had my moments of over indulgence though and I have paid for it by feeling ill and whipped not long after. In trying to counteract the candy eating I’ve been doing lately and hoping to get this sugar craze out of my system, I started looking at my vegan cookbooks for healthy recipes that would make me feel like I was getting my fill and yet not missing out on anything. 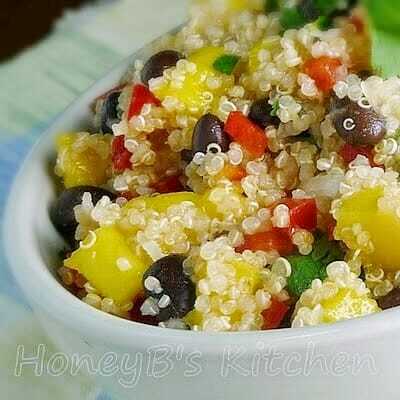 I found this recipe for Quinoa Salad and the colors alone in the salad were enough to tempt me! I wanted something that would be delicious and yet good for me, that would hopefully kill that desire for anything full of sugar mid-day. My sweet/heat addiction did have me changing this recipe up a bit from the original when it came to the dressing. I thought the sweetness of the mango would help with my sugar craving and I feel that when you are putting cilantro in anything, it is natural to add lime juice and heat. I made this first without the packet of Splenda but after tasting felt that it needed a little more sweet boost than the mango was giving it. One packet (teaspoon) of it worked out just right for me and I love how it turned out. I am looking very forward to having this for lunch again today! Other quinoa recipes you may enjoy! Bring 1 cup of water to boil. Add quinoa and once it has come back to a boil, reduce heat and simmer about 12 minutes or until all water is absorbed. Remove from heat and place in mixing bowl to cool. Dice peppers, onions and mango into small pieces. Drain and rinse black beans. Measure 1 cup. 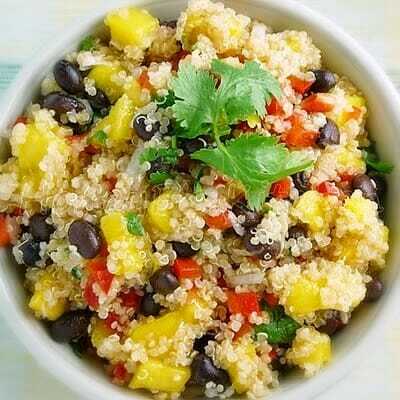 Add vegetables and beans along with chopped cilantro to cooled quinoa. Whisk together grapeseed oil, cayenne pepper, sugar (or splenda), salt, and juice of one lime. Pour over quinoa mixture and toss to coat. This looks awesome! I'm going to have to make this soon. Before mango season disappears. Sounds very healthy and delicious too! :-) With that touch of mango,lime juice and cilantro,I am sure it is going to taste classic. I've never used Quinoa, before, what is it? With mango, it has to be great! Thanks. awesome dish! Quinoa is a very health benefiting wholegrain, which should be included more in everyones weekly meal planning. This looks GREAT. I have issues with (staight) quinoa, but this salad looks fantastic. I tried this last night: love it!!!! Thanks for sharing and if you don't mind I will post it on TIY! I just made a variation on this for dinner tonight! SO good. This is definitely entering my regular rotation. Thanks! Oh wow, this sounds fab, and right up the nutritious alley that I need to be! It has all the flavors I adore 😉 Thanks for stopping by my blog, and commenting 🙂 My family is in flood recovery mode, and while it's stressful, they know that they will be taken care of. mmmm, i would happily dig into that, delicious!! That looks fantastic! I love quinoa salads. I'm so happy to find another fan of quinoa! Very nice recipe. I'm big fan of the quinoa and this salad accomplishes all the healthy patterns – great for the palate! mmm mmm I love quinoa! Any pretty much any dish with black beans and cilantro. Nummy! 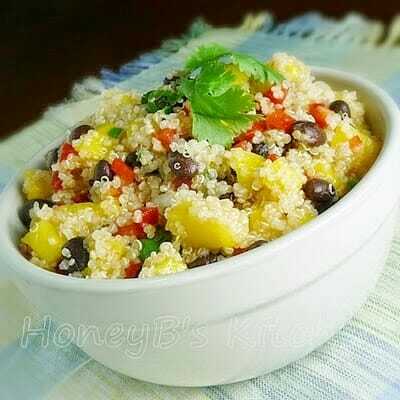 Quinoa, black bean and mangoes are 3 of my favorite foods. Putting them all together in this salad must be heaven in a bowl. I most certainly will try this when I get my hands on a mango. Such great fresh flavors here! Hey Shelby! I was searching for Quinoa recipes on Google and yours popped up right away! This looks delicious and I'm going to make it today! Yay 🙂 Thanks for letting me know that! Hope you enjoy Sabrina! I made it and it was DELICIOUS! YUM!!!!! !